Quick & easy to make chewy snacking treats! Preheat oven to 1800. Preheat oven to 1800. Grease the bottom and sides of a 9 x 13-inch pan. Press in a piece of parchment paper that is big enough to cover the bottom and sides of the pan. Grease the top and sides of the parchment. Put the sugar, eggs, oil and vanilla sugar into a large bowl and mix on medium speed until combined. Add the ground almonds and potato flour and mix well. 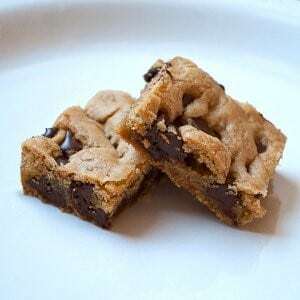 Add the chocolate chips and mix to distribute.Spoon the mixture into the prepared pan using a spatula to spread evenly.Bake for 35 minutes or until the edges are brown, or a toothpick inserted in the center comes out with just a few crumbs on it.Allow to cool and then cut into squares or bars. These bars freeze well. Defrost just before serving.